Reminiscent of The 48 Laws of Power, legendary football coach Mike Leach’s inspiring history of Apache war leader Geronimo demonstrates the timeless lessons we can learn from his life—featuring a foreword from the bestselling author of Empire of the Summer Moon. Says New York Times bestselling author Brian Kilmeade, "Mike Leach put together a compelling book and humanized a man many thought never existed. A great read." Told in the style of The 48 Laws of Power, Leach’s compelling and inspiring book examines Geronimo’s leadership approach and the timeless strategies, decisions, and personal qualities that made him a success. Raised in an unforgiving landscape, Geronimo and his band faced enemies better armed, better equipped, and more numerous than they were. But somehow they won victories against all odds, beguiling the United States and Mexican governments and earning the respect and awe of those generals committed to hunting him down. While some believed that Geronimo had supernatural powers, much of his genius can be ascribed to old-fashioned values such as relentless training and preparation, leveraging resources, finding ways to turn defeats into victories, and being faster and more nimble than his enemy. The tactics of Geronimo would be studied and copied by the U.S. military for generations. Drawing on his fascination and love for American Indian lore, Mike Leach explains how the tribe’s organizational structure helped Geronimo be successful. He chronicles specific battles and shows how Geronimo got the most out of his warriors and outthought his enemies. Leach also captures the mysterious nature of leadership itself. Pain, pride, humility, family—many things shaped Geronimo’s life. In this remarkable book, Mike Leach illustrates how we too can use the forces and circumstances of our own lives to build true leadership today. 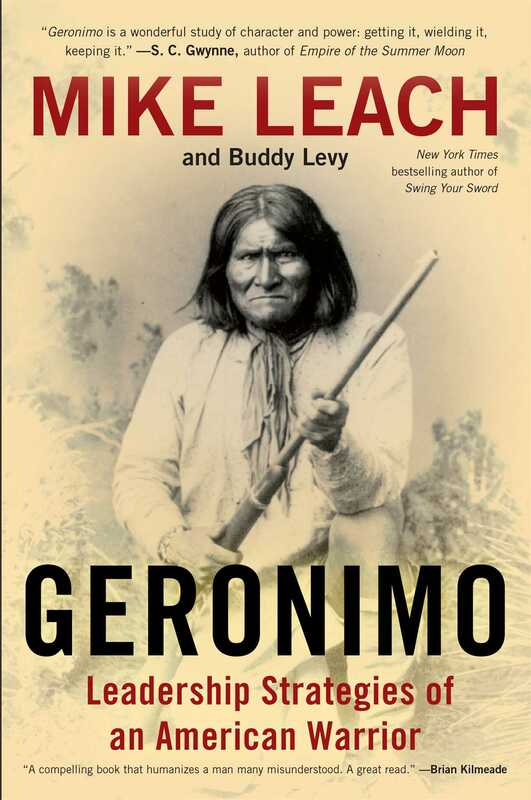 "Geronimo is wonderful study of power: getting it, wielding it, keeping it. It's also an exploration of character. In the hands of Leach and Levy, the story of this brilliant Apache leader comes into sharp focus, both in their narrative of his life and in spirited commentaries on its meaning... Leach is a coach, yes, and a great one. But he is no ordinary coach. He is also a scholar; he knows what he is talking about. [Leach] has always dipped into history to motivate his players and his record speaks for itself." "Mike Leach coaches the way Geronimo lived his life--with purpose, passion, and a unique brand of leadership." "A compelling book that humanizes a man many misunderstood. A great read." "I have read and studied all styles of leadership books, but I find Mike Leach's lessons learned from Geronimo a very practical and educational analysis of what leadership is all about." "From Sun Tzu to Geronimo to Mike Leach, the principles of leadership have stood the test of time. Coach Leach takes a subject much written and opined about and, not unlike what he has done on countless Saturdays across America, made it intriguing, interesting or, if you were on the opposing side, confounding. Consuming this book will allow you to either absorb these maxims or further enhance your leadership skills." "Mike loves the will of man: the underdog, the warrior, and the one who does more with less. He knows greatness comes with sacrifice, and it starts with knowing yourself. In Geronimo, he shares the character of a true American badass who exemplified all of these things—and he shows how that character can be put to practice in the game we're all in: the game of life." "The Renaissance man Mike Leach does it again! His book Geronimo shows how traits like ambition, independence, discipline, and audacity can take a person from good to great—and even from great to legendary. Leach's lessons—his takeaways from Geronimo's life—are fascinating and useful, whether in a locker room or a board room." "...there is no football coach in America--past or present--who would dare to write about an historic American Indian leader and then apply those leadership traits to the way he coaches. But Coach Leach has done exactly that, and he has done it brilliantly."